As the temperatures begin to rise, many families find themselves frequently outside. After an especially long winter, it has been so refreshing to let my kids run around outside. There are backyards and parks to play in, trails to hike, and camping trips to plan. My kids love exploring and playing in the trees, grass, and bushes, whenever they can. Unfortunately, spring and summer also mean bugs, lots and lots of bugs! Most bugs are perfectly harmless and their bites will not cause any long term damage, but there are several insects and spiders that can have very dangerous bites. It is difficult to tell, from an initial bite, whether it is serious or not, especially if you didn’t see what caused the bite. 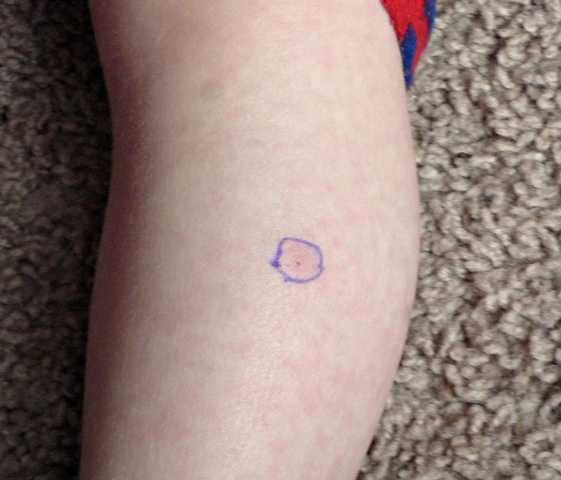 On the way back from an Easter egg hunt, this past week, my husband noticed that my son had a bug bite on his leg. It was bright red, about the size of a dime, and my son complained that it hurt. I don’t want to be the mom that takes her children into the doctor’s office at the drop of a hat, but I also don’t want to leave the bite for a few days and have it turn out to be a really serious issue. My husband, an ER nurse, had a great idea. 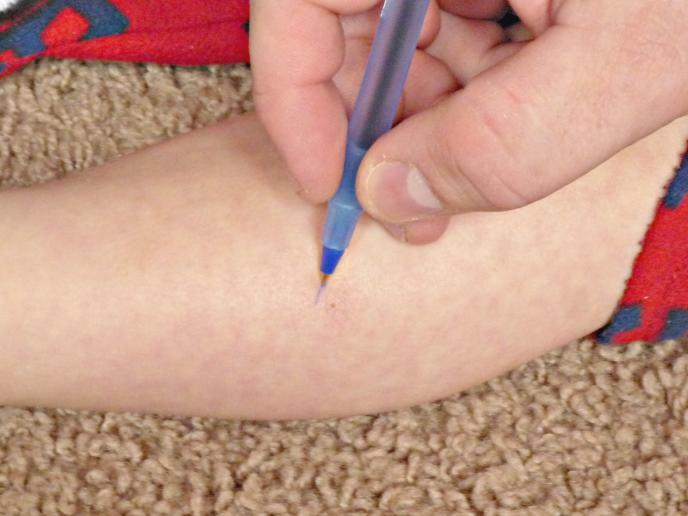 After we washed the area of the bite, he circled the area, with a non-toxic pen. This was a perfect guide, to determine if there was substantial swelling, around the bite, over the next few hours. It was also a great way to determine if the redness was spreading or moving up his leg. We also took a picture of the bite. We compared the picture to my son’s leg, every few hours, to check for discoloration, building pus, or if a bull’s eye was forming. Each of those symptoms signals a potentially serious problem, and the need for further medical assessment. The picture was so handy, because I was able to keep an eye on the bite, without second guessing whether I was remembering the original bite accurately. As your family ventures into the great outdoors this summer, don’t forget these handy tricks to keep an eye on mysterious bug bites, and help keep your family safe. Disclaimer: I am not a medical professional, nor do I claim the ability to accurately diagnose or identify a medical problem. If your child has any of these symptoms following a bug bite or sting, please seek medical help immediately: hives, wheezing, shortness of breath, muscle cramps, fever, rapid heartbeat, faintness, seizures; and swelling of the face, lips, throat, or tongue. If you suspect that you have been bitten by a venomous spider, please seek medical help immediately.